Hasbro turns out to be a game-winner for shareholders, while rival Mattel is several moves behind. When toymaker Hasbro Inc. (NASDAQ:HAS) reported earnings Monday morning, investors had expected only tepid results, as the company had predicted flat to slightly falling revenue for the current quarter. This outlook came on the heels of worse-than-expected results last week from industry-leading competitor Mattel, Inc. (NASDAQ:MAT) . Even in the face of tough comps and an extra week of expenses, Hasbro grew revenue to $849.7 million, up 2% from the prior year's quarter, with a standout increase of 43% in its gaming segment. Earnings increased to $68.6 million, and earnings per share of $0.54 were up 41% over the comparable quarter last year. According to Thomson Reuters, analysts had expected earnings of $0.32 on revenue of $822 million. Data source: Hasbro SEC filings. All dollar figures are in millions. YOY = year over year. Doc McStuffins Operation game. Image source: Hasbro. Hasbro noted that partner brands saw an expected 18% sales decrease, primarily from a drop in Star Wars and Marvel brands ahead of major movie releases that would occur later in the year. The 43% increase in the gaming segment to $142.9 million was led by several new games, including Toilet Trouble, Speak Out, and Fantastic Gymnastics, while Pie-Face continued its impressive results seen over the holiday quarter. Emerging brands, which includes Baby Alive and FurReal Friends, increased an impressive 25% to $70.2 million. The company also reported strong growth in Latin America, even in light of continuing economic and political turmoil in parts of the region. This marked the first time since 2000 that Hasbro exceeded the quarterly revenue of industry leader Mattel. Hasbro's acquisition of the coveted Princess and Frozen lines from The Walt Disney Company (NYSE: DIS) last year marked a turning of fortunes for the longtime rivals, though the stage was set much earlier. Hasbro began to differentiate itself from its larger rival by focusing on international markets, omnichannel distribution, and digital content related to its products. The company also began to mine its intellectual property for movie tie-ins to generate interest in its brands. The company expects its strong performance to continue with several notable theatrical releases in the coming year. Marvel's Guardians of the Galaxy Vol. 2, Spider-Man: Homecoming, Thor: Ragnarok, as well as Star Wars: The Last Jedi, and Hasbro's Transformers: The Last Knight and My Little Pony: The Movie are expected to drive additional merchandise sales related to the movie characters. Hasbro Chairman and CEO Brian Goldner noted that these movies catered to different fan bases and demographics and that the company had unique marketing strategies related to each. My Little Pony: The Movie will be the first feature film fully financed by the company's Allspark label. Hasbro will have greater participation in the box office than ever before and has plans for other properties, including building a cinematic universe focused on more of a millennial audience, featuring G.I. Joe and nostalgic animated favorites from its '80s vault, including Micronauts, ROM, Visionaries, and Mobile Armored Strike Kommand (M.A.S.K.). Stretch Armstrong, Hasbro's gel-filled action figure, will be getting a kids' show on Netflix, Inc.'s (NASDAQ: NFLX) streaming service later this year, marking the first original programming by Hasbro Studios for the streaming giant. The 26-episode series, which is set to make its debut in the fall, follows the adventures of Jake Armstrong, who becomes a superhero after accidental exposure to an experimental chemical. Will Hasbro wear the crown? Hasbro continues the successful transition that began years before it landed the Disney Princess and Frozen deal. Deals like this have led to a divergence of fortunes from rival Mattel, which has struggled since losing the Disney dolls. 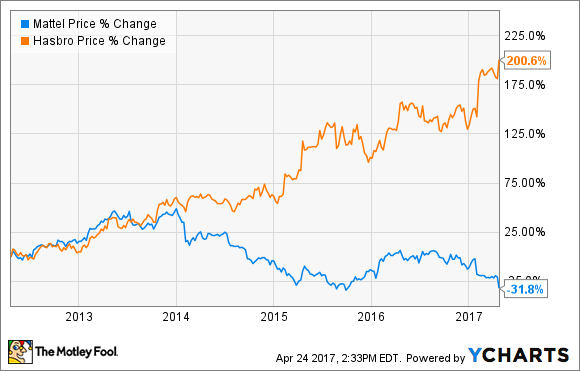 This reversal of fortunes could lead Hasbro to the position of industry leader and stockholders in the toymaker to even greater gains.